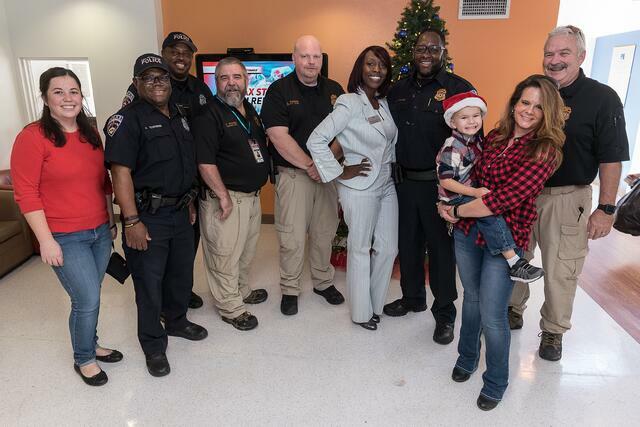 The Port Houston Police and Security departments volunteered at a local housing facility, New Hope Housing, Inc. at Brays Crossing and Jacinto City Healthcare Center in Houston, bringing Christmas cheer to more than 140 residents on Dec. 20. They provided plush blankets and tupperware to the Houstonians while entertaining them with holiday music, snacks and games. The Silver Santa Project idea came about three years ago when Port Police Chief Mark Smith was visiting his mother at an assisted living facility where she stayed. “It was sad to see that not many seniors are remembered in nursing homes, especially during the Christmas season. I wanted the Police department to do something for our local seniors, so I came up with the Silver Santa Project,” said Smith. This year, the Port Houston Police and Security departments raised more than $2,000 towards the Silver Santa project through donations and various fundraisers. The project requires several months of planning led by a steering committee of port police and security personnel. New Hope Housing’s mission is to provide life-stabilizing, affordable, permanent housing with support services for people who live on very limited incomes. The organization strives to be an enduring institution serving Houston’s most vulnerable citizens. In addition, Port Houston’s police team distributed 14 bikes to students at De Zavala Elementary for exemplary school attendance on Dec 13. The port’s Police department also participated in several other outreach opportunities this year, including “National Night Out,” “National Coffee with a Cop Day” and Red Ribbon Week.